NEW YORK — Hundreds of Communist Party USA activists will be gathering this October in a series of three regional conferences as part of the CPUSA’s campaign to broaden and deepen party building. 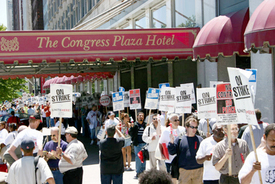 Members on the East Coast and parts of the South will be meeting in New York City Oct. 13. Midwest members will be meeting in Chicago, Oct. 13-14, and members from the Southwest and West Coast will be meeting in Oakland, Calif., Oct. 20. Members will attend workshops after each meeting’s keynote speech. District organizers from New York, Chicago and Oakland will deliver the opening presentation. Members will get a chance to network with one another. The conferences will develop a course of action for further membership growth, building the Communist press and how this helps to strengthen and build movements such as those for peace and immigrant rights. Building the Young Communist League and among young workers will also be featured. The Communist Party aims to better facilitate and support the work of its members and party organizations at the grass roots through these regional conferences. Mora added, “We’ll be talking about the current situation from our unique perspective as Communists, and figuring out what we can do better to grow our organization and press as part of that bigger movement for social change, especially at the club level.” A club is the local, grassroots organization of the Communist Party. Leaders of the CPUSA’s various districts are also enthusiastic about an opportunity to strengthen regional ties and build the grass roots of the Party. “It will be a great opportunity for members to share experiences about the success and frustrations of building the party at the grass roots,” said New York State Communist Party chair Libero Della Piana.